Mia Zamora and Alan Levine are starting the third year of the Networked Narratives open course, based at Kean University but open to all. We are impressed that you were brave enough to click a link here. In the past we’ve explored using and creating media for civic imagination (2017) and implications of a digital life (2018). In 2019, we are feeling, well, a bit… paranoid… about the internet. Did you know that software is out there that can theoretically remotely access, control, and record you from the camera on your computer? Don’t take our word for it, read up on what the FBI said about this. And did you see what we did there? We shared a link to a news story. It looks like news, but is it? How do we know who, what to trust anymore online? With cries of Fake News everywhere, in 2019 we are well into a Post Truth society (actually the Oxford Dictionary declared that the Word of the Year in 2016). Beyond moving to an off-grid cabin in the woods, how can we manage these times? 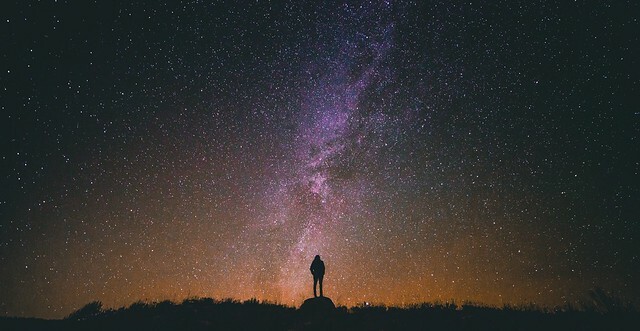 We have no guarantees, but we believe that practicing and improving your skills in Digital Alchemy, in a connected group of other alchemists, is a way to bring some Light into the Darkness. Are you willing to journey with us, and a group of Kean University Students? Join us in Networked Narratives. 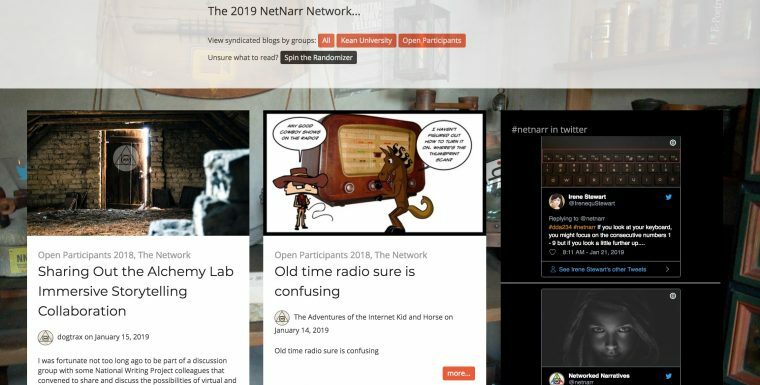 While we will use the web as a platform of creativity and communication, Networked Narratives (aka #NetNarr) is not simply a course delivered online. At its core it is an on-the-ground course in Media Studies at Kean University, with registered students who will spend time each week in a classroom. Taught in that room by Mia Zamora, she is joined via the interwebs by Alan Levine who will beam in from a mysterious location. Class syllabi are available for Kean University courses ENG 4060 (undergraduate) and ENG 5085 (graduate). At the same time, as an open connected course, we are offering the experience to anyone else on the internet who wants to do all or part of the same activities and assignments. Why? They might be interested in the same topics. And also because that’s how networks work; the connect us beyond our known/familiar surroundings. Kean students will benefit from participating with a larger group of people from different places, interests, and cultures. Open participants get to pick and choose what interests them. How does this mix happen? Rather than participants doing their work in a centralized learning management system, they create and reflect in their own digital space, a blog. We use syndication technology to bring together everyone’s work in one place (latest on the front page or all in the Syndicated Category), where you might see some open participants are already active. 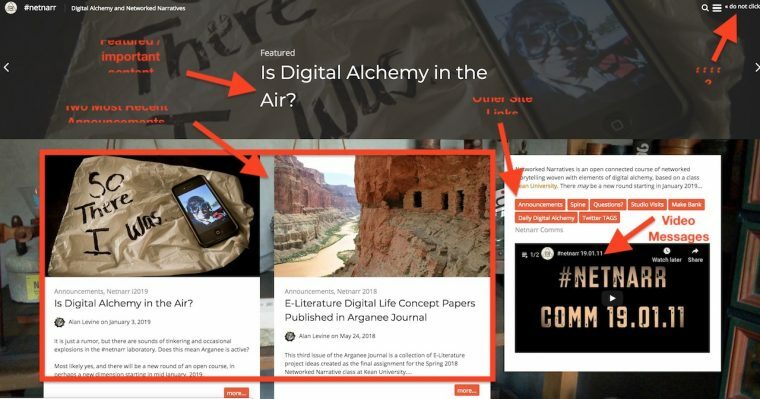 We will connect well in other digital spaces, both Twitter, and the Alchemist’s note-making-web annotation-tool, hypothes.is. During course we are investigating, questioning, examining the ways in which information about us is gathered and used online. We will seek insight into surveillance technology and bots, and get to be better at identifying reliable information. We will explore representing these issues through digital/networked art, meeting with other experienced Digital Alchemy practitioners via our Studio Visits, and by the end of the course, by collaboratively authoring a field guide to Surviving the Dark Times with Digital Alchemy. How Does This Networked Course Thing Work? We will let you know that there are a lot of moving parts. Much may be new to you. Don’t worry, we will take small steps. Our experienced open participants and Kean students from last year are eager to help too. The first two weeks are meant to get you set up with the main tools you will use and get started communicating with each other. Doing the creative work will be much easier to do with a desktop or laptop computer and ideally, a high-speed internet connection. It’s not to say one could not do this on a mobile or tablet device, but it’s not recommended. We hope you have access to a camera or a smartphone or a computer with a built-in camera. But are you ready for this? This is a class where your teacher expects you to use devices in class. You should bring, if you have them, a laptop and/or smartphone to each class. Our technology policy is that you should use whatever resources you need to be successful in this class. It is your responsibility to determine the most effective uses of them. We are not checking your screens and what you are doing on them. As a group, we will decide if there are any situations where we should not have laptops and smartphones out. You are responsible for reviewing the weekly course announcements published the Tuesday morning before class and coming to class prepared to discuss the readings/viewings assigned the week before. You are responsible for posting weekly reflective blog posts that must be completed by end of the day Sunday of each week. Kean students will meet in person for discussion and hands-on activities every Wednesday 4:15 – 7:30pm ET — the same activities will be posted here for our open participants. Each week will start with a looooooooooong announcement like this one (just scroll, see how long this thing goes) that will give an overview of all the activities and assignments for the week. Way down at the bottom you will find a summary checklist of all the required items (that’s for Kean students, you open folks are free to pick and choose). Kean students are expected to write a summary reflective blog post by midnight Sunday. These announcements will be published (hopefully) on the NetNarr site by early Tuesday, Eastern Time. The most recent ones will always appear in the top two blocks of the front entrance below the top featured content as well as in their own corner of the site. Each month, we will have a different format and scope for our class activities. For a glance into the direction of the course, see our Course Spine. But Wait! What About Grades? Kean students should review the grade contracts (different versions for undergraduate students and for graduate students). After deciding on their desired grade to aim for, they will submit their choice via a special form provided directly to them. We will also make an editable copy available for open participants; it will be interesting to see what kinds of levels of commitment open folks might define for themselves. What is the course theme? You’ve seen in our video that some of us think it is dark times for the internet, a space when created was thought to be democratizing, fair, leveling boundaries, and a free space to share information and creativity. Is that what it is in 2019? What keeps you up at night or worried about your own internet activity? Are you thinking about privacy, personal data, surveillance, how entities might be trying to influence the public? Discussion: How do you get a sense of what you can believe, trust in from the information you see online? An introduction to Digital Alchemy. What do you know of about the ancient practice of Alchemy? Where is the first place you go to to find out? Might it be an encyclopedia with no single author? What does it mean to consider that spirit of curiosity, experimentation, a dab of mystery and dark arts into the digital space? Yes, we keep saying it, but what do we mean by digital alchemy? Reference last year explore the discussion and twitter chat we held last year, as well as some responses to this question in previous years of this course from DDA 13 and DDA 235 (and you will discover soon about the DDA site). Do you consider yourself a digital alchemist now? What would it mean to carry that title? Introductions to your teachers, Mia Zamora and Alan Levine and what they have learned in previous versions of this course (open participants, introduce yourselves maybe in twitter using the #netnarr hashtag?). And logistics like a syllabus (link coming) and information on the grading contract (ditto on link). Internet Mapping Activity. Many of us spend hours per day on the internet. Do we have a map or a model in our head? a physical metaphor? Do we know where we are in it? And what does the climate there look like? 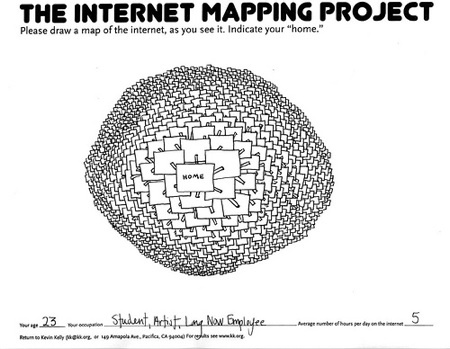 This is an activity you should do as a drawing of the way you see the internet (personally). With a pen or pencil (or crayon) Download the map template (PDF), print it out, and draw your map. Include where you are in it, but also, add something that indicates how you see the climate there, or what you might have to worry about. 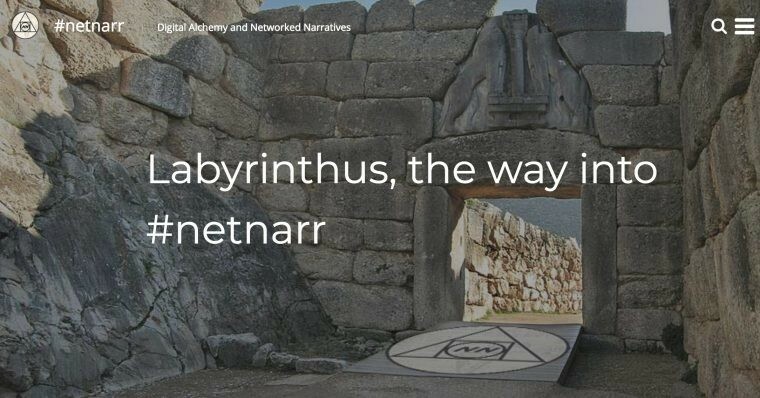 For a start, we are asking participants to prepare for the start of Networked Narratives by taking a trip through the Labyrinthus. In this walk through “choose your own path” activity, you will make choices about setting up or using an existing Twitter account, Hypothes.is account, and an alchemist’s notebook (aka a blog). If this seems like a lot, just relax, Ask us of other alchemists for help. We will be working on getting everybody full set up in the first two weeks of class. Sending a hello twitter tweet including the #netnarr hashtag. Make sure your blog has at least one new post in it. 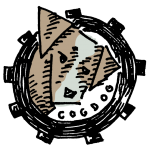 Then see if your blog is listed with the Kean University Participants or the Open Participants. We will talk a bit more about the nuts and bolts of blogging in class and next week as you get started. Do not get too worried now about the look and appearance, it’s more important to get a writing practice going. But if you are eager to write, do not let us slow you down, see the suggestions for How to Blog Like a Digital Alchemy Champion. For Kean students, we will do a walkthrough of the course web site. It has many corridors and tunnels. 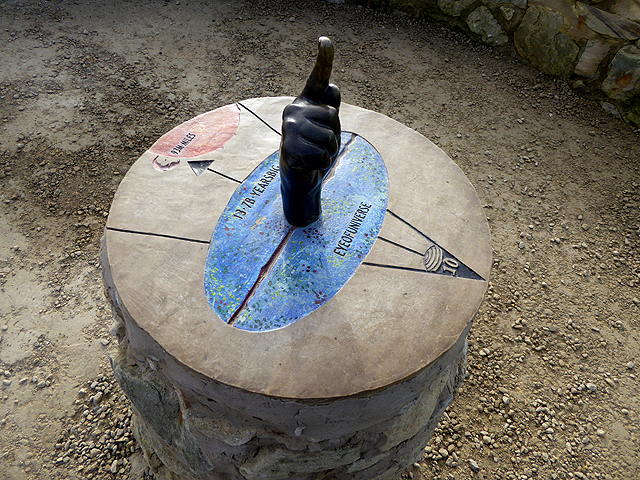 The entrance to the NetNarrr site showing where announcements are posted and key links. Do you wonder why it says “do not click”? Below the fold will be the latest syndicated blog posts from Kean University and Open participants (plus a feed of recent twitter activity). We try to always provide more; these might get you thinking about the course themes or something to write about in your blog. People have long speculated about the future, quite often not optimistically. Watch a 5 minute video of 1960s British Kids with dark predictions for their future (Paleofuture). What is the danger of being too focused on our online activities? Watch The Panda is Dancing. It’s quite an old movie now, from 2002, but the scene of personalized advertising in the movie Minority Report was more than accurate to the internet of 2019. How/where is the internet like this today? These are the things to do to practice your Digital alchemy this week. Set up accounts. Make sure you have completed the Labyrinthus, set up all accounts. Twitter. Follow @netnarr on twitter to make sure you see the newest ones. Make sure you can access the #netnarr tag on twitter (we suggest logging in to Tweetdeck, and adding a column for #netnarr. Learn more about using Tweetdeck. Then start picking other people in the stream worth following. DDAs. Complete at least one Daily Digital Alchemy this week- you respond to them in twitter. Share your Internet Mapping Project drawing. Take a photo of your map drawn for the Internet Mapping Project and share it in the Somni-Porta via the upload form. Submit your response to the grading contract. For Kean students the link for completing your contract will be shared in class. Open participants are welcome to edit the open grading contract or devise one of their own. Each week Kean University students must post to their blog a summary of their activities for the week by end of the day Sunday. Do more than just describe and list the items above; reflection means expanding on what these activities mean, where you have questions, what you connect them to. Be sure to use links in your reflection to connect readings/videos you are talking about, or perhaps, to link to your own work completed on other web sites (e.g. the Daily Digital Alchemies). Review again the suggestions for How to Blog Like a Digital Alchemy Champion. We will devote a good bit of time to helping people sort out their digital alchemy tools, and review the blogging process. Are you thinking at all about the camera on your laptop? Give it a good stare! 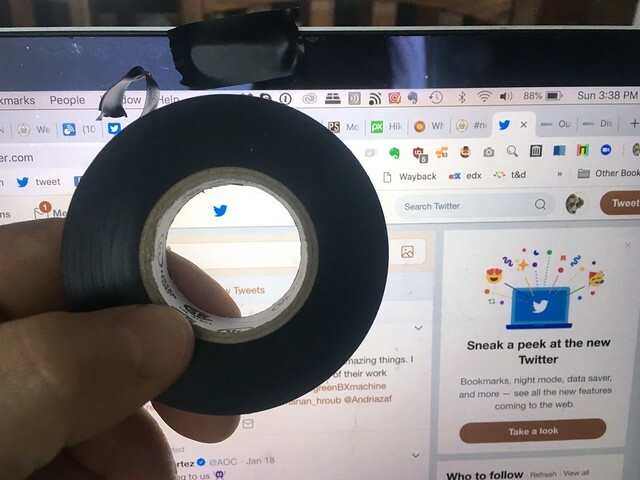 You don’t really need tape on your laptop camera, just need to think about it and what it says about 2019.